Crews were expected to begin lightering 110,000 barrels of low sulfur fuel oil from the grounded tank ship White Sea to Bouchard Barge B-230 at 10:00 p.m. Lightering operations are expected to take about ten to 12 hours. Crews were expected to begin lightering 110,000 barrels of low sulfur fuel oil from the grounded tank ship White Sea to Bouchard Barge B-230 at 10:00 p.m. Lightering operations are expected to take about ten to 12 hours. Officials anticipate refloating the 800-foot Liberian-flagged tank ship about 8:00 p.m. Friday during high tide. 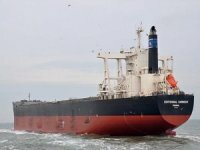 The 800-foot doubled-hulled tank ship White Sea was traveling outbound from Bayonne, N.J. with 556,000 barrels of low sulfur fuel oil en route to Singapore when it lost steering and ran aground, just outside the shipping channel. on a hard, sandy bottom in the Ambrose Channel about four miles north of Sandy Hook. N.J. 6:30 a.m. today.. The White Sea is owned by the Singapore-based Tanker Pacific Management on a time charter to United Arab Emirates-based Westport Shipping Services. 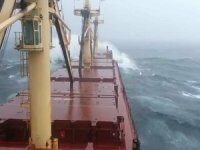 Its local agent is Atlantic Shipping Company. There are no reports of product in the water. Its crew deployed an oil containment boom around the vessel as a precaution. Capt. 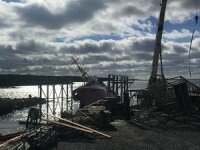 Robert R. O'Brien, Coast Guard Captain of the Port of New York and New Jersey approved the salvage plan which calls for additional barges should more product need to be lightered from the White Sea to refloat it. 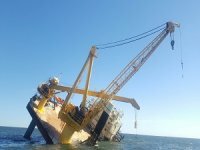 A dive survey is scheduled for first light to assess the condition of the ship's hull. The Bayonne, N.J.-based Coast Guard Cutter Penobscot Bay relieved the cutter Katherine Walker, another Bayonne-based cutter, in enforcing a 500 yard security zone around the tanker. The ship suffered breaches to two ballast water tanks, but the product compartments inside the double-hulled ship remain intact. 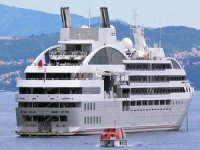 There are no reports of injuries aboard the White Sea. 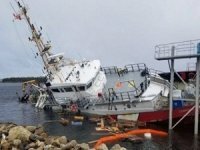 "By lightering 110,000 barrels, we hope to safely refloat the White Sea and avert any type of environmental impact a serious hull breach may cause," said Lt. Craig Toomey, a Coast Guard Sector New York Command Duty Officer. "Vessel groundings, especially groundings of tank ships filled with oil, call for exercising prudence and patience in order to avoid any additional hull stress a rushed salvage operation may cause." 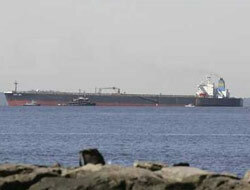 The location of the grounded ship caused no delays to other incoming and departing shipping. The Sector New York Vessel Traffic Service is constantly monitoring the impact of this vessel grounding to inbound and outbound traffic, advising mariners to proceed with caution. The U.S. Coast Guard deployed several assets to monitor the grounding. A Station Sandy Hook rescue boat established a safety zone around the ship and an Air Station Atlantic City helicopter conducted an overflight pollution assessment. The cutter Katherine Walker arrived on scene and was prepared to deploy additional oil containment boom if necessary. The crew of the cutter Katherine Walker recently completed training on the Vessel of Opportunity Skimming System (VOSS) a deployable modular oil recovery system that can be affixed to a single ship or to two ships working in tandem. VOSS has a maximum skimming capability of 190 gallons per minute. Once the ship is freed, it will be taken to a nearby anchorage for a close examination if its hull and steering gear. A Captain of the Port Order is prohibiting the ship from departing until a satisfactory inspection by the ship's classification society. At 9.30 p.m., the seas were reported as calm, two-to-four foot seas and northwesterly winds at 10-15 knots.